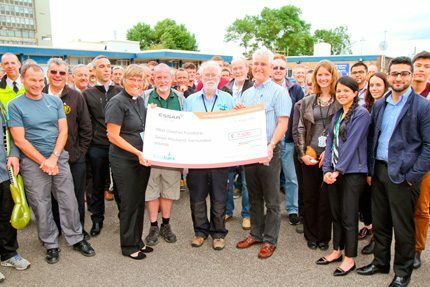 In recognition of the 4th anniversary of the acquisition of the Stanlow Refinery, Essar Oil UK, whose Ellesmere Port site won its 19th consecutive RoSPA award, made a £7,500 donation to the West Cheshire Foodbank. “The safety, good health and wellbeing of everyone who works at Stanlow is core business for us,” said site manager Jon Mason. Essar Oil UK’s commitment to occupational health and safety at its Ellesmere Port site saw the company win a RoSPA Gold Award for 2015 and the Order of Distinction for 19 consecutive Gold Awards. Representatives of the West Cheshire Foodbank attended the anniversary celebration at Stanlow, receiving over 900 kilos of food donated by employees in addition to the donation. “West Cheshire Foodbank is only able to respond to people struggling with food poverty because neighbours are generous,” said reverend Christine Jones, chair of the trustees. Stanlow produces approximately 15% of UK transport fuels, including three billion litres of petrol, 3.5 billion litres of diesel and two billion litres of jet fuel per year.